Joining the RIP VIII Challenge! For whatever reason, I have never joined up with this one … which is silly, since this is definitely a challenge right up my alley!! So I’m committing to reading at least four books between September 1 and October 31. 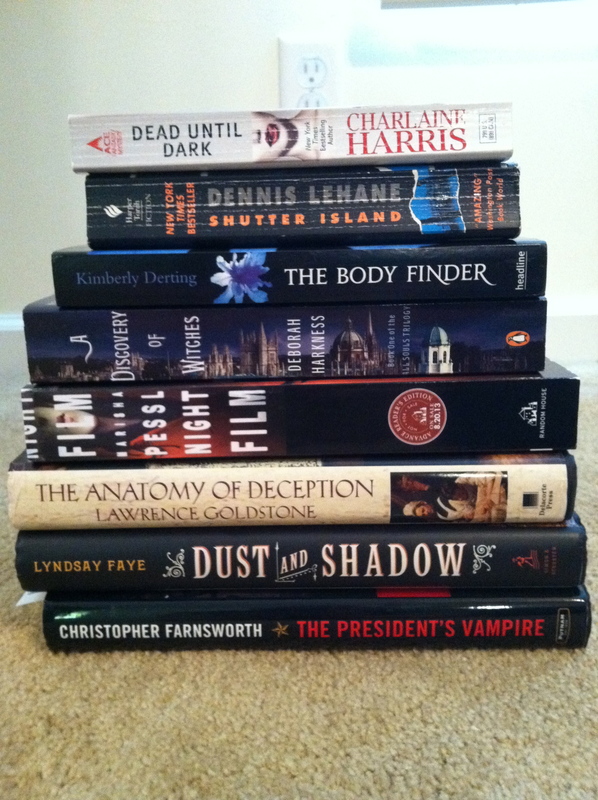 I’ve got a ton of mystery/thriller books on my shelves … that’s practically all I read. But, I did pick out a stack that I will be choosing from for this challenge. I’m enjoying all these *dark* titles on people’s sign-up posts. 🙂 Have fun with your stack of books! Yay! This is such a fun challenge! You simply MUST read Shutter Island! Such a good read (and have you seen the movie??)! I just found almost the entire Sookie Stackhouse series at Goodwill today and couldn’t resist…I bought them all 🙂 So I just might be reading Dead Until Dark as well. I hope you enjoy all of these and happy reading!!! My wife and soon-to-be son-in-law both really enjoyed Shutter Island. I’ve seen the film adaptation several times and love it, I imagine I’ll watch it again during RIP. Great that you are joining in and enjoy seeing your pile of books. I hope you have fun with the challenge! Oo you do have a bunch on your shelf! I have been hearing really good things about Night Film. Have a great reading season!